The Archtop Tremolo is based on the Hamer Studio body, the third classic Hamer design introduced in 1977. Upgraded with a solid Maple top on Mahogany body, the tone is beefy yet focused and a Dark Cherry Burst on figured Maple veneer results in a visually inspiring instrument. It comes standard with a Wilkinson Tremolo and classic Hamer controls and switch orientation. The new 2018/19 range of Hamer Guitars are now available in the UK! 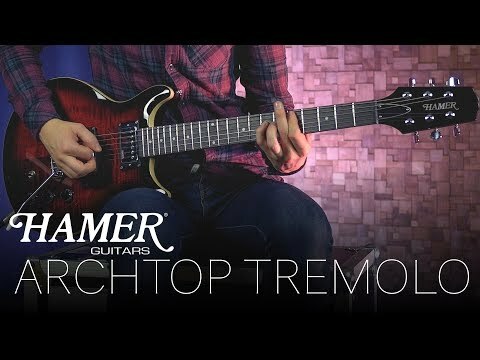 The Archtop Tremolo - The 2018/19 Archtop Tremolo is based on the Hamer Studio body, the third classic Hamer design introduced in 1977. Upgraded with a solid Maple top on Mahogany body, the tone is beefy yet focused and a Dark Cherry Burst on figured Maple veneer results in a visually inspiring instrument. It comes standard with a Wilkinson Tremolo and classic Hamer controls and switch orientation. More information on the Hamer range at UK distributor Sound Technology Ltd: https://www.soundtech.co.uk/music-retail/hamer-guitars Demo by Elliott Thomas / Sound Technology Ltd.